I've finished sewing the next border of my Rotherfield Greys quilt by Di Ford from her book, Primarily Quilts. The pattern calls for 3/4" hexagons, but I made mine 5/8" just to be sure that they fit inside the border with ample seam allowance. I made these hexagons from my scrap bag and from scraps from the previous borders. The photo was taken outside, and it shows the pinks to be brighter than they really are. Note: There is finally no snow on the ground! The next round is half square triangles, and I've started to cut those. I don't know the name of the maker, but these are all beautiful blue batiks and are made from 3/4" hexagons. This is Michelle's center for the Mrs. Billing's Coverlet, but she isn't going to make the quilt. She always has great show and tell and is so creative, so I'm sure she will do something neat with this block. These hexagons and diamonds are 1 1/4". 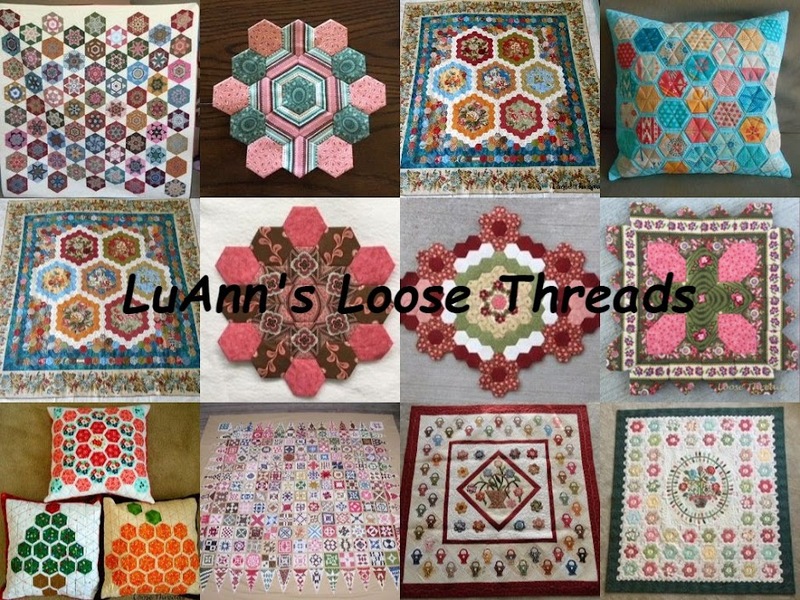 Michelle is also doing the Temecula Quilt Company Fussy Friday Stars. Here are just a few of what she has finished so far. The stars are 2" diamonds. I love her fussy cutting. Love this star, and you can see the one at the left of the photo is cut from the same fabric. Here are more of Michelle's stars. She has used Jo Morton, Edyta Sitar and Judie Rothermel fabrics. I think these are Michelle's blocks, too. She gets a lot done and has beautiful fabrics. I don't know the maker of these blocks, but the fabrics are pretty. I think this little quilt belongs to someone at Back Door. These are all made from Sue Daley patterns. I don't know the name of the maker of this quilt. She came in to the meeting toward the end with show and tell. Her machine quilting is done on her home machine and is gorgeous. There is always so much inspiration from this group, and we always have a good time and return home with lots of ideas for new projects.